Santa will definitely find you if you are walking in Italy, as he also delivers presents to kids around Italy on the 25th December. But apart from Santa, Via Francigena pilgrims walking in Italy should be expecting additional Christmas gifts from the old witch Befana on Epiphany Day, 6th January. Befana is loved by Italian children for obvious reasons and a very important part of Christmas in Italy. 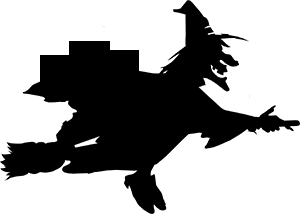 On the night of 5th January, the eve of Epiphany Day, Befana travels all around Italy on her broomstick to fill your stockings with sweets and gifts; only if you have been good all year of course. If you haven’t been so good, it is quite likely she will find you still but only to leave a few lumps of coal instead. So if you are on the Via Francigena in Italy at Christmas time, don’t forget to leave your stockings by the Christmas tree and a small glass of wine and some food for the Buona Befana on the eve of the Epiphany. Like Santa, Befana is a difficult one to spot but according to legend, she may appear at a window in Piazza Navona in Rome on Epiphany Day. If you make it to Rome around those dates, it is well worth going to the Piazza and have a look. Fornovo di Taro, in Parma on the Via Francigena, hosts an annual festival dedicated to Befana on 5th and 6th January. Long life to the Befana! For more information about the Via Francigena, the Camino to Rome, and to book your holiday, contact our travel specialists. Operations Manager Valeria comes all the way from Southern Italy! She studied American and European Languages and Literature in Rome and holds a Masters Degree in Tourism. She lived in the South of Spain and cruised the seven seas before docking in Dublin.